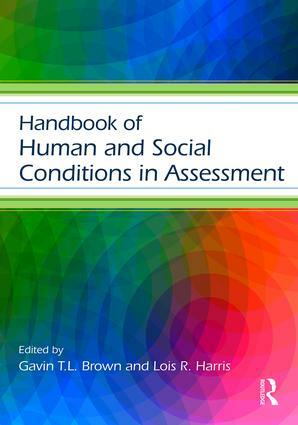 The Handbook of Human and Social Conditions in Assessment is the first book to explore assessment issues and opportunities occurring due to the real world of human, cultural, historical, and societal influences upon assessment practices, policies, and statistical modeling. With chapters written by experts in the field, this book engages with numerous forms of assessment: from classroom-level formative assessment practices to national accountability and international comparative testing practices all of which are significantly influenced by social and cultural conditions. A unique and timely contribution to the field of Educational Psychology, the Handbook of Human and Social Conditions in Assessment is written for researchers, educators, and policy makers interested in how social and human complexity affect assessment at all levels of learning. Organized into four sections, this volume examines assessment in relation to teachers, students, classroom conditions, and cultural factors. Each section is comprised of a series of chapters, followed by a discussant chapter that synthesizes key ideas and offers directions for future research. Taken together, the chapters in this volume demonstrate that teachers, test creators, and policy makers must account for the human and social conditions that shape assessment if they are to implement successful assessment practices which accomplish their intended outcomes. Student Participation in Assessment: Does It Influence Self-regulation?